Ayala, Morelos.- President Felipe Calderón explained that we should all be equal in the eyes of the law, a single law that should govern Mexicans’ lives and come from the force of the state and not permit any other than that passed by Congress and based on the Constitution. These were the President’s words at the Civic Commemorative Ceremony of the 91st Anniversary of General Emiliano Zapata, where he added that during the year of the Nation: it is our duty to ensure respect for the law, the most solid basis for the country’s development and progress. 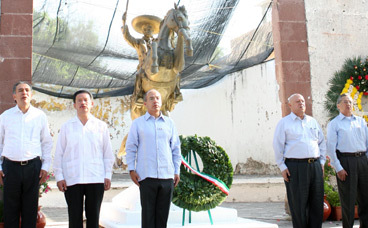 “Let us embrace the cause of General Emiliano Zapata: Freedom, Justice and Law and let our generation be on a level with the history, desires and dignity of our heroes,” he said. He said that during the year of the nation, it is our duty to defend and expand the freedoms of all Mexicans and our obligation to construct a fairer, more inclusive and equitable Mexico. In the Chinameca community, in the municipality of Ayala, state of Morelos, the President declared that in order to ensure that land belongs to those that work it, those that possess it must have full legal certainty about their rights. These rights must be recognized, legitimized and expressed in public documents with validity for both other persons and the state. He said that for this reason, during this administration, Federal Government will ensure the delivery of the Certificate of Ejido Law and the Certificates of Agrarian Law that proceed and are requested. That is why he urged Congress and its members to ensure that the state fulfils this obligation and seeks and promotes the resources required to make this possible. The President said that the reforms the country needs are those that should propel it into the 21st century and will directly benefit all Mexicans. Nowadays, Mexicans are called to transform the institutions and structures we inherited from the 20th century, explained President Calderón, adding that the aim is to construct the institutions and structures of the Mexico of the future. He said that Federal Government has assumed an agenda of changes designed to destroy the inertias that bind us to the past, combat poverty and improve the standard of living of Mexicans with least, particularly in the countryside and the outskirts of major cities. He explained that transforming Mexico involves guaranteeing medical service, medicines and treatment for all Mexicans, whether they live in the countryside or the city.